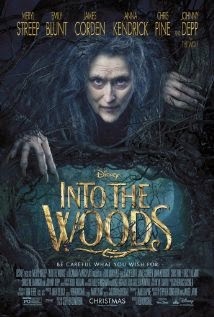 Into the Woods (2014), PG, 124 minutes - Ordinarily, I'm not much of a musical fan but this big screen adaptation of the Broadway show caught my eye thanks to its cast and the way it mashes up a number of fairy tales (including Cinderella, Little Red Riding Hood, Jack and the Beanstalk, and Rapunzel). 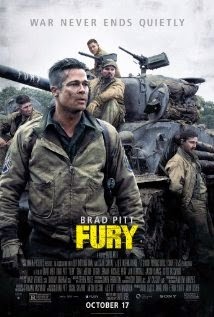 Fury (2014), R, 134 minutes - This is another film that I was fortunate enough to catch before it disappeared form theaters, but haven't had the time to get anything written up. Fury is a film that caught my eye as soon as I saw the trailer earlier this year. Then a couple former co-workers highly recommended it and I knew that it would be right up my alley. 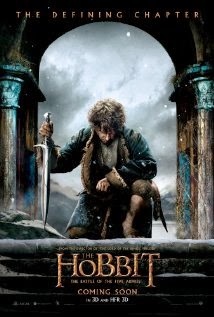 I've always enjoyed period pieces, especially those that portray the difficulties of war time. Fury takes place in the waning days of World War II as the Allied forces push into Nazi Germany and focuses on Staff Sergeant Don 'Wardaddy' Collier (Brad Pitt), his four man crew, and the tank they operate. 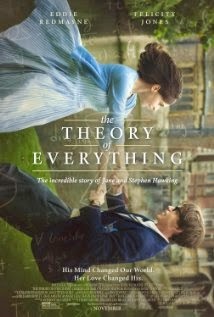 The Theory of Everything (2014), PG-13, 123 minutes - I have been looking forward to this film for a few months, not only because Stephen Hawking is a fascinating figure, but because there is no way to tell Hawking's story without at least touching on Amyotrophic lateral sclerosis (also known as ALS, or as it is mentioned in the film, Lou Gehrig's Disease). As some of you may know, my uncle has lived with this debilitating disease for over nine years now. I wasn't sure if I'd have a chance to see it as it arrived at our local art house theater amidst the holiday chaos, but I was fortunate enough to find the time to sneak it in last week, on one of its last days here in town. It is finally here. 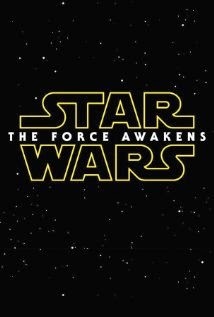 After years of wondering whether or not there'd ever be another Star Wars film, a historic purchase of the franchise by Disney, and the announcement that J.J. Abrams would helm an Episode VII, we finally have the first look at The Force Awakens! I've always loved Star Wars. But at the same time, I've never been such a fanatic that I would get in great debates over the tiniest details. Just like most people my age, I believe that Episodes IV, V, and VI comprise one of the best trilogies I've ever seen (if not the best) and, while I can see some good in Episodes I, II, and III, I generally look down on them as having not lived up to the originals. 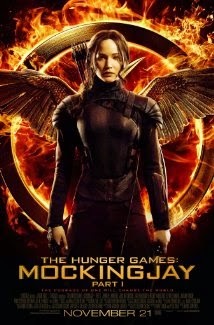 The Hunger Games: Mockingjay - Part 1 (2014), PG-13, 123 minutes - Those familiar with the books know that The Hunger Games was originally a trilogy, the third installment of which was Mockingjay. Shortly after the monumental success of the first film in 2012, it was announced that not only would they be completing The Hunger Games story on the big screen, but that the final chapter would be split into two films (which seems to have become a popular trend in recent years). At the time of the announcement, I was a little disappointed. Being a fan of the books, I didn't feel as though splitting Mockingjay was necessary. It just seemed like a greedy Hollywood move. Having seen Mockingjay - Part 1, I have to admit that I now understand why they made the split. 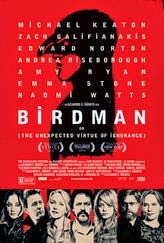 Birdman or (The Unexpected Virtue of Ignorance) (2014), R, 119 minutes - I've been looking forward to this film for just about a year now, ever since learning that Michael Keaton would be starring in the latest project from director Alejandro González Iñárritu. Since its initial release a month ago I have been waiting not-so-patiently for a) it to come to my local art house theater and b) a little break in the long list of things we've been trying to get done in the new house. Thanks to a technical difficulty last week that wiped out this review once, I'm finally able to get my thoughts down 'on paper' so to speak. 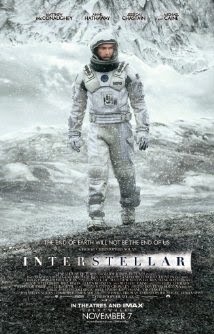 Interstellar (2014), PG-13, 169 minutes - There are a handful of directors whose films I will make the time for no matter what. 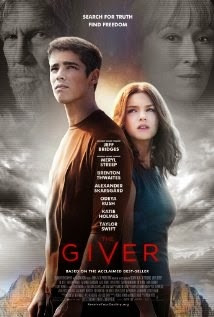 It doesn't matter how much I know or have seen of one of their films, I know that I'll enjoy it. Christopher Nolan is in that group and I have tried very hard to avoid any other information about Interstellar that could spoil the film. These efforts were undoubtedly helped by our recent move - I just haven't had the time to browse the web and inadvertently stumble across something spoilery. 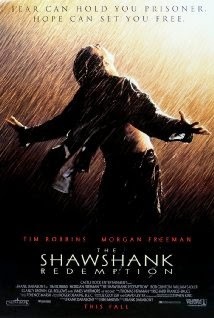 The Shawshank Redemption (1994), R, 142 minutes - On this date twenty years ago, my favorite movie of all time quietly hit theaters across the country. The funny thing is, like most people, I never saw The Shawshank Redemption in the theater and would have no idea that it would have a lasting effect on me until almost three years later when I first encountered it. In October of 1994, I was a sophomore in high school and a substantial amount of my time was taken up by basketball or just about any other sport that caught my attention for longer than five minutes. I was the backup point guard on the JV team that year. I hadn't yet discovered my love for film and my love of sports dominated my free time. Looking back, my discovery of Shawshank a couple of years later was the result of a unique set of events that explain my initial draw to the film and how it has grown to become so important to me over time. 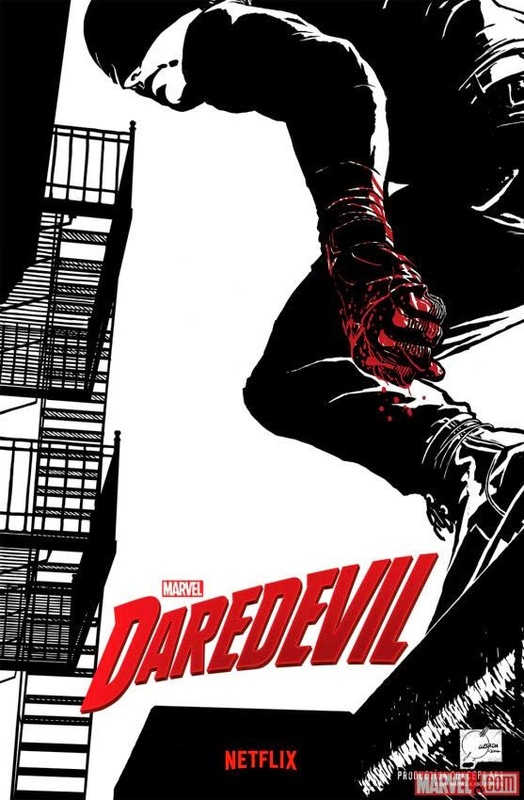 Daredevil (2015), Netflix, 15 Episodes - I've mentioned in some of my reviews of Marvel's films in the past that Daredevil is my favorite comic book character. So as one may expect, I have been extremely excited about this series since it was announced a year ago. This live action series marks Marvel's efforts in adapting one of their most critically acclaimed characters since they regained the film rights to the property from Fox in early 2013. 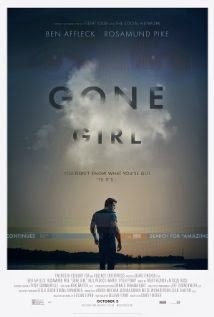 Gone Girl (2014), R, 145 minutes - My wife and I have been extremely busy with all of the things that come with buying and selling a house. And while we're very excited about it, the process has put a bit of a damper on our usual weekend routine (including my theater hopping habit). Things are moving along nicely and by the end of the month we should be getting settled in our new home. A midst all the house related craziness, I was able to sneak some time yesterday to see Gone Girl, the new David Fincher directed thriller based on Gillian Flynn's best selling novel from a couple of years ago. 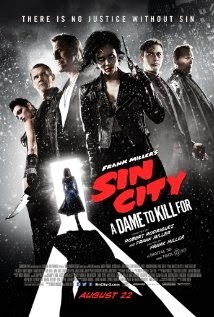 Sin City: A Dame to Kill For (2014), R, 102 minutes - Nine years after its predecessor, Sin City: A Dame to Kill For finally made its way to theaters last weekend. Those with either a keen eye or memory (or both) may remember that this film was one of the honorable mentions on my Most Anticipated Films of 2013 list. 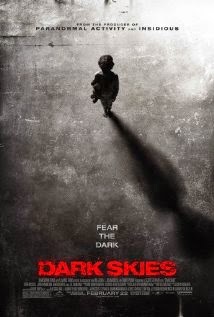 That was before further delays pushed its release to the end of this summer (and a repeat appearance on this year's list). Sin City: A Dame to Kill For showcases the same grim, gritty, stylized violence that fans of Frank Miller's work have come to expect on either the page or the screen. 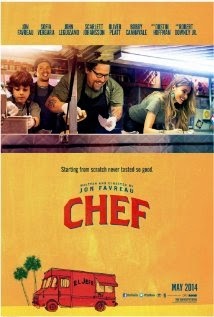 Chef (2014), R, 114 minutes - I've heard a lot of great things about Chef since it was released earlier this summer and I was pretty excited when I was finally able to watch it last week. 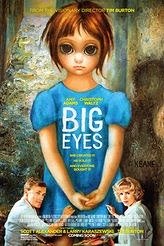 It is a smaller film that first hit theaters back in May so there's a pretty good chance that it's no longer playing at a theater near you. 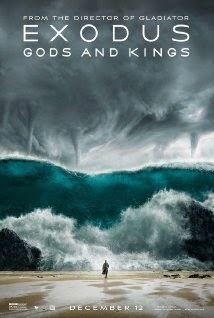 The good news is that it looks like it will be available on blu-ray/digital/On-Demand in about a month. 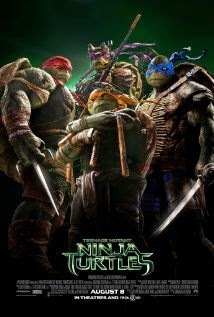 Teenage Mutant Ninja Turtles (2014), PG-13, 101 minutes - This reboot of the live action Teenage Mutant Ninja Turtles franchise came out last weekend and has already been successful enough at the box office that a sequel has been announced with a scheduled 2016 release. That's all well and good, but what I had heard about the film itself over the past week was that it fell flat and wasn't really all that good. I tend to try not to let a bunch of critic-speak sway my desire to see a film, but sometimes that's difficult to do when the prevailing opinion is negative. I had a little free time earlier today and I decided to give it a shot and what I found was a film that at its core, got the TMNT vibe down pretty well.